…The boys stood watching the fish swimming back and forth in the jar. Seryozha was very pleased, but Vitalik felt a little sad. He was sorry he had given away his fish, and what is most important, he was afraid to tell his mother that he had exchanged it for a whistle. Vitalik did not know what to say. “I don’t know,” Vitalik mumbled. “Murzik! Murzik!” Vitalik called, but Murzik was nowhere to be seen. Vitalik put on his coat and went outside. He was just about to go back and say he couldn’t find Murzik, when Murzik himself sprang out of an opening that led into the basement and ran over to the door. Murzik purred and rubbed himself against Vitalik’s leg and meowed softly. But Murzik wouldn’t listen. He looked up adoringly at Vitalik, rubbing himself against his legs and pushing at him gently with his head as if begging him to hurry up and open the door. Vitalik tried to drag him away from the door, but Murzik insisted. Vitalik opened the door quickly, slipped inside and closed it before Murzik had time to follow him. “Meow!” cried Murzik from the other side of the door. He picked up the cat and started to push him back into the hole under the house. Murzik resisted with all four paws. He didn’t want to go back into the basement. At last he managed to push the kitten through the hole, all except his tail which still stuck out. The tail wiggled angrily for a little, then disappeared inside. Vitalik was glad: he thought Murzik understood that he must sit tight in the cellar. But the next minute Murzik stuck his head out of the hole again. He looked around for something to cover the hole with. There was a brick lying on the ground near the cellar. Vitalik picked it up and stood it up against the opening. Vitalik went back into the house and told his mother he couldn’t find Murzik anywhere. At dinner that day Vitalik felt very miserable. He didn’t want to eat anything. But Murzik didn’t answer. Vitalik bent down and peeped through the hole, but it was too dark to see anything. But Murzik did not appear. “You won’t? All right, you can stay there hungry,” said Vitalik and went home in a huff. At home he felt very lonely without Murzik. Besides, his heart was heavy because he had deceived his mother. His mother saw that he looked unhappy. “I don’t want a fish,” he said. Vitalik looked up and saw Murzik standing on the window-ledge. How had he got out of the cellar? She opened the little window and Murzik came in. She tried to grab him, but he must have guessed that something was wrong because he darted under the table. Vitalik crawled under the table. When Murzik saw him he fled for cover under the sofa. Vitalik was glad, and though he dutifully crawled after him, he made as much noise as he could so as to give Murzik a chance to escape. Murzik sprang out from under the sofa and Vitalik started chasing him round and round the room. Murzik jumped on to the window-sill where the empty fish bowl stood and was about to jump back through the window but missed his footing and fell into the fish bowl with a great splash! The next moment he was out, shaking himself furiously. Mother seized him by the scruff of the neck. “Mummy, Mummy! Please don’t beat him!” cried Vitalik and burst into tears. “For this.” And Vitalik pulled the whistle out of his pocket and showed it to his mother. Vitalik picked up Murzik and took him over to the stove to dry. With his wet fur sticking up all over Murzik looked more like a hedgehog than a cat. He looked skinny too, as if he hadn’t eaten for a whole week. Vitalik felt very sorry for him. He took the piece of meat out of his pocket and laid it on the chair in front of Murzik. Murzik ate it up with great zest and settled down on the chair to dry. After a while he climbed on to Vitalik’s lap, curled up in a ball and began to purr as loudly as he could. The sound of his purring made Vitalik somehow feel very happy. It must have been the purring because what else could it be? Best wishes and next Wednesday we will read next story! Today we continue reading stories for kids what were written by Nikolay Nosov. These stories were published first in the magazine for children “Murzilka”. Then many of them make up the foundation of the Nosov’s first collection Rat-tat-tat (Тук-тук-тук), 1945. And today we’ll divide this long story on two parts like they did it when they published the stories in magazine. Vitalik’s mother made him a present of a crucian carp and a small aquarium for it to live in. It was a beautiful little fish and Vitalik was very excited about it at first, he fed it and changed the water in the bowl regularly. But after a time he lost interest in it and sometimes he even forgot to feed it. Vitalik had a kitten, too, called Murzik, a grey fluffy kitten with large green eyes. Murzik loved to watch the fish swimming about in its bowl. He could sit for hours beside the bowl with his eyes glued to the carp. Seryozha took a whistle out of his pocket and blew a piercing blast on it. “Let me have a try,” begged Vitalik. He took the whistle and blew on it. It responded with a loud trill. Vitalik was enchanted. He longed to own the whistle but at the same time he didn’t want to part with his fish. “All right, take it,” said Vitalik, finally giving in. They had a hard time taking the fish ,out of the bowl. It kept slipping out of their hands. At last, after splashing water all over the floor, Seryozha managed to catch it, wetting his sleeves up to the elbow in the process. Vitalik brought a mug full of water and Seryozha dropped the fish into it. Then the two friends went to Seryozha’s place. The jam jar turned out to be not quite so big as Seryozha had said, and the fish had much less room than in its bowl. 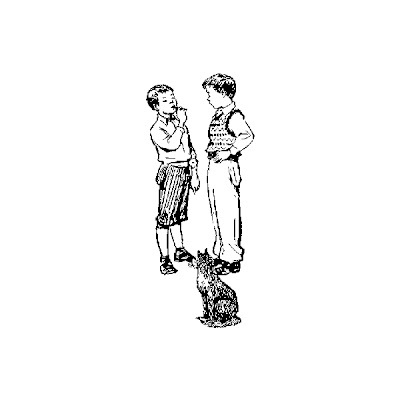 The boys stood watching it swimming back and forth in the jar. Seryozha was very pleased, but Vitalik felt a little sad. He was sorry he had given away his fish, and what is most important, he was afraid to tell his mother that he had ex changed it for a whistle. To read continue please click at the little picture…. Best wishes and we’ll continue next Wednesday! Stories from Soviet Childhood: Cucumbers! Today we continue to read stories for kids what were written by Nikolay Nosov. These stories were published first in the magazine for children “Murzilka”. Then many of them make up the foundation of the Nosov’s first collection Rat-tat-tat (Тук-тук-тук), 1945. Once Pavlik took Kotka fishing with him (Pavlik and Kotka – names of the boys). But they had no luck that day: the fish simply wouldn’t bite, so they went home. On the way, they climbed over the fence into the collective-farm vegetable garden and filled their pockets with cucumbers. The watchman saw them and blew his whistle, but they ran away. Pavlik was afraid he would get into trouble for picking vegetables from the collective-farm plot, so he gave all his cucumbers to Kotka. His pockets were full of cucumbers, he had cucumbers inside his shirt and a large cucumber in each hand. “Where did you get them from?” asked his mother sternly. Kotka started pulling the cucumbers out of his pockets. “I shan’t go. The old man has a gun. He’ll shoot me.”! Mother gave Kotka the two cucumbers which didn’t fit into his pockets and led him outside. She went inside the house and closed the door. Kotka started off slowly down the street. “I’ll throw them into the ditch and say I took them back,” Kotka said to himself, glancing around him. “No, I’d better not. 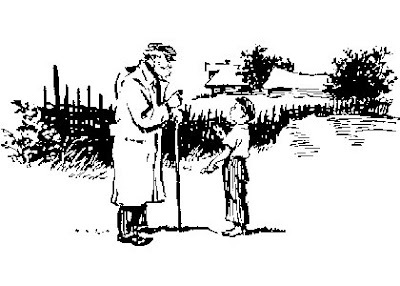 Someone might see me, and besides, the old man will get into trouble all through me.” He went down the street, sobbing. He was very scared. He came to the end of the village and took the path over the field. There was not a soul in sight. He was so frightened he almost ran the rest of the way to the vegetable plot. When he got there he stopped outside the watchman’s hut and began to cry. The watchman heard him and came over. Kotka pulled out the cucumbers and laid them on the ground. “Is that all?” asked the old man. “Yes.…No….not quite. All except one,” said Kotka and started crying again. Svet Sunday: Stories from Soviet Childhood! Today we want to introduce you to our new series: Stories from Soviet Childhood! Childhood is the most important period in the life for everybody. Most of our beliefs we get from childhood. We learn what is good and bad when we are kids. And these beliefs are very difficult to change later in life… So we [my generation] are like we were brought up in our Soviet childhood. So in these series we’ll try to tell what was the cultural ground where we grew up. Another reason to make this series – we think that is just interesting to read and watch – and if you have your children maybe you would like to show or to read it for them? Believe The Stories from Soviet Childhood would not teach your kids something bad! When Mishka and I were little we wanted very badly to go for a ride in a motor car, but we couldn’t get anyone to take us. We begged all the drivers we knew but they were always too busy to bother with us. One day, as we were playing in the back yard, a car drove up. The driver got out and went off somewhere. We ran over to look at the car. I ran up and hopped on beside him. The car started and before we knew it we were racing down the street. Mishka got frightened. “I’m going to jump off!” he shouted. Passers-by stopped to stare at us. A militiaman (militiaman is policeman) at the intersection blew his whistle. Mishka jumped off, but he didn’t let go of the rack and his legs dragged along the ground. I leaned down and started pulling him up by the coat collar. I tugged and tugged until at last I got him safely back on the luggage rack. “Now hold on tight, you silly,” I shouted. Just then I heard a laugh and looked up to see that the car had stopped and a crowd had gathered. I jumped down. But he was too scared to move. I had to pull him off. The militiaman came running up and took the driver’s number. The driver got out and everyone jumped on him. There was quite an argument and Mishka and I were forgotten. “Let’s clear out,” I whispered to Mishka. When nobody was looking we dived into a side street and ran home. We were all out of breath when we arrived. We did look a sight! Mishka’s trousers were torn at the knees and his knees were scratched and bleeding. He got a proper scolding from his mother! You took down the number of a car, and it isn’t right. That is, the number is right, but it wasn’t right to take it down because the driver wasn’t to blame. Mishka and me are to blame. He didn’t know we were riding behind. So please don’t punish him because he is a good driver and it was all our fault. We sealed the envelope and dropped it into the letter-box. We do hope he got it!